I have the original LP alas nothing to play it on now, very unusual score I rate it highly. I love the score to Moonraker. It's Always been a favourite of mine. 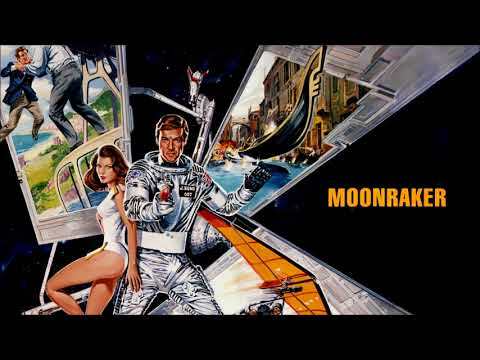 John Barry's Moonraker score is one of the finest in the franchise. It's so rich and otherworldly. It's a shame a good chunk of the score was lost. However there have been fan restorations and re-recordings of the missing music here. Last year purchased the Live and Let Die exteneded CD, found the additional tracks were arguably the best. Thank you both. Bond music is one of my biggest passions. I own every soundtrack to every Bond film and game. Even online bootleg versions. I'm that much of a completion. I've searched the internet for years finding those lost music cues. The majority missing were very good and memorable ones. I thank the dedicated fans who sought out to remaster and recreate those lost tunes. Recently started to get digital copies of the soundtracks, slowly building the collection back up. My mum was good friends with John Barry's niece and worked at a club the John Barry's seven played at, so always been a fan of his music, have numourous compilation albums with variations of his Bond and none Bond music. The theme begins with a rising three-note phrase played on strings and horns (same notes as "where... are... you? "), leading into strings that descend along the scale. This is played twice. It's set against a catchy open/closed triangle ostinato; a rising/falling countermelody in the usual late Barry style played on harp, celli, bassoon and low horns; subtle sustained strings to outline the harmonies; an eighth note ostinato played on piano and synthesizer; and decorative glissandos. So many elements juggled perfectly! Then Shirley Bassey enters and begins doing her magic. She takes over the three-note phrase ("where... are... you?") while everything else stays the same for a few bars. That's the introduction. Then, as the A section begins, she sings "just like the Moon-raker goes...", and the eighth note ostinato disappears. At the same time, the drum kit --cross stick, hi-hat and kick drum-- enters, along with electric bass, acoustic guitars playing the chords, and a playful improvised disco synth on top. Also, the triangle ostinato changes. Every four bars, the descending strings reappear. As we enter the B section, Shirley sings "I've seen... your smile", the eighth note ostinato reappears for seven bars, then vanishes as Shirley sings "and it aaalways seems... you LOOOVE... ME..." During the second, quieter "you... love... me...," as the tense F#7 chord is heard, high strings play three-note phrases. Then we're back to the intro. Everything plays out the same way all over again. Only the lyrics and the disco synth change. Shirley's last "You... love... ME..." leads into my favorite part: the ending. As Shirley's voice fades away, we alternate twice between B and Em chords, played on horns and trombones along with the subtle sustained strings. As before, we can also hear the triangle ostinato, the rising/falling countermelody (especially beautiful when outlining those two chords), the eighth note clarinet/piano/synthesizer ostinato, electric bass, acoustic guitars and drum kit. The theme is in the key of B major, so hearing the B chord repeated insistently tells us the theme is about to end. And it does, with a sustained B major chord played on strings and brass. Just beautiful. Such a lovely piece of music. Like all good music, it embodies the very specific and distinctive artistic sensibility of its composer, one that would be difficult to replicate. It has a spacey, reflective and mysterious quality, which is evidenced not only in the composition itself (meaning melody and harmony), but in such elements as the playful descending strings and the triangle. It captures the wonder of space, not unlike Flight Into Space, but in a more soothing, less dramatic way. They're companion pieces. It's John Barry, who as usual takes the concept behind a film and creates an in-depth musical exploration of it. I've got a near-complete transcript of the song, as described here. If I haven't finished it's only because it's a drag to replicate the improvised disco synth. One of these days I'll finish it and share it in audio form, probably with and without the main melody. That way one can appreciate the backing more clearly. I also wanted to provide a link to this other analysis of the theme, more focused on harmony. It's a great read. This is my 2000th post, so I wanted to do something special. As I had explained earlier in the post above, I was working on a transcript of the Moonraker song. And now it's done. You can hear it in audio form in the videos below. It's not a great mix (just the MIDI I put together played through a soundfont), but there's both a version with the melody and, more interestingly, one without it. You can listen to them individually, or mix them together with a sound editor. You can study them, study the arrangement. Once again, the MP3 files are just the MIDIs played through a basic soundfont, but I trust you'll find them of interest all the same. Furthermore, the MIDI files are included so you can process them with your high-quality virtual instruments of choice. Thanks for these, I’m sure I’ll have a go at tinkering about with this track. Thank you for that, @mattjoes! No problem, @vzok and @DarthDimi. One could create a fun remix. Be sure to share whatever you do with the music if you deem it interesting!